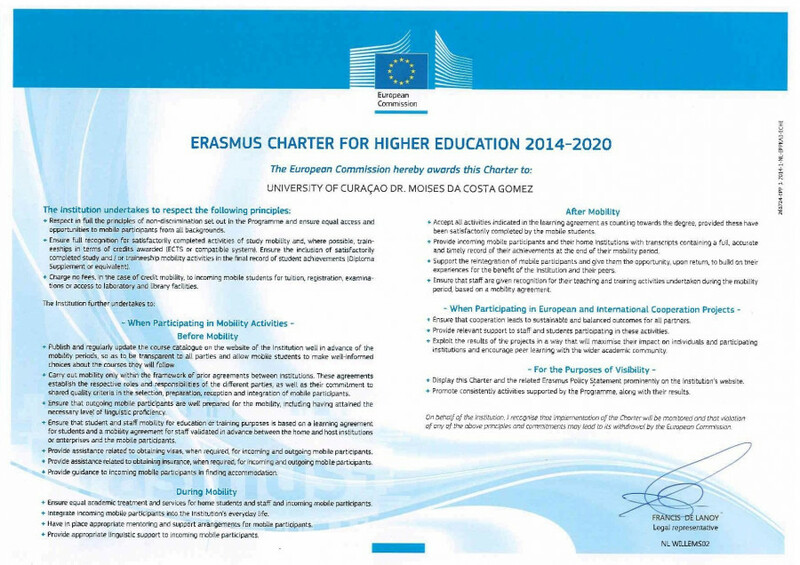 The University of Curaçao Dr. Moises da Costa Gomez has acquired the Erasmus Charter for Higher Education for the full duration of the new Erasmus+ Programme (2014-2020). The Erasmus Charter for Higher Education (ECHE) provides the general quality framework for European and international cooperation activities a higher education institution may carry out within the Programme. The award of an Erasmus Charter for Higher Education is a pre-requisite for all higher education institutions located in an eligible country and willing to participate in learning mobility of individuals and/or cooperation for innovation and good practices under the Programme. The Charter is awarded for the full duration of the Programme. The University of Curaçao Dr. Moises da Costa Gomez (UoC) is committed to become a center of knowledge in the region, which will then be the connecting point between the European continent and the Caribbean and South American regions. Considering the fact that Curaçao is strategically located in the Caribbean and also that the region shares a common history together, provides the UoC with many opportunities for a major role in the region to act as a knowledge center. Both the local as the international student can profit out of this since both are going to get a lot of knowledge which they will be able to take home and share with others. The same also applies to the staff, who through the exchange in the European continent as well as in the region, will be able to get a variety of experiences after sharing with local and international actors. Currently, the UoC has various cooperation agreements with various Dutch institutes. It is the intention to make new regional cooperation agreements to which are of interest for the further development and expansion of knowledge, both for students as for the staff. Thanks to the completion of the accreditation process and the achievement of a positive assessment by the NVAO, the UoC will be considered as an equal partner in negotiations for new cooperation agreements. The International Office of the UoC will play a central role as organizer and companion to students and staff from abroad, but also to the UoC local students who wants to go abroad. All information will be given by the International Office, who will structure the subministration of information in a most efficient way possible. In addition, the International Office will provide all the information for the disclosure of the possible financial funds students and staff can apply for. The faculties will however be in charge of informing interested students about the courses that they can follow at the UoC. They will also be in charge of the organization of these courses and the schedule that students and staff can follow. The faculties are also in charge of making new agreements with foreign HEI's for student and staff mobility. The International Office will be informed about these new agreements and will promote these under the staff and students of the university. The UoC is working on different areas of the 5 priorities of the Modernization Agenda. The UoC has a close cooperation with the working field which is continuously looking at the needs in the field. These needs are translated into courses in the curriculum so that the students have enough knowledge of how to solve the problems that the field is experiencing. Besides this students are taught to become critical citizens who are also triggered to do research. This stimulates the students to ambition more than just the obtained degree, but to pursue a higher education and to participate into lifelong learning. Higher degrees can be obtained at the UoC, depending on their choice of Master study or it can be pursued abroad. These are mostly some Masters programs and or PhD programs. The UoC is committed to continuous improvement of the quality of the education provided. This is shown by the fact that there is a constant attention to the needs of the labor market. In addition, the UoC started a few years back, with the accreditation process which resulted in a positive assessment of the NVAO for all the programs that went through this process. The UoC has also set up a Quality and Assurance department which checks not only the quality of the programs given by the university but also checks the quality of the service given by the administrative departments of the university. By encouraging mobility and more collaborations with foreign institutes, the UoC wants its own staff and students to expand their knowledge and apply this in the curriculum after returning from abroad. In the curriculum there is space reserved for sharing of the experiences. It is the idea that both staff members and students must be part of the growing global village of knowledge which originates after participating in exchange programs. By participating in exchange programs, the UoC wants to play a key role as sharer of information between the Caribbean region and the European region. Our strategic position gives us a the opportunity to become a central knowledge center in this region. The UoC wants to achieve this role through research, participation in exchange programs and internships abroad. The UoC is committed not only to depend on governmental funding but is still looking for other ways to raise funds for projects as exchange of students. By looking for international funds, searching for sponsors and research projects, are examples of how the UoC tries to raise funds. For further details about participating institutes, your application and important dates, contact our International Office at internationaloffice@uoc.cw.